was the subject of proposal. My first thought was inside my beautiful home…boring. Then maybe inside some monumental building, architectural interiors? …nope nothing like that in Reno. hummmmmm….I thought on this subject for the next 40 paces and down the stairs to my desk during my lunch hour. 4×5! How about…… if I can’t shoot one of my many favorite interiors then give a visual feast of something a lot of people never really have ever seen yet know the subject. Everyone has seen the infamous photographer under the cloth of an old time camera. Right? Ansel, Robert Capa, Dorothea Lange, Bernice Abbott, Henri Cartier-Bresson, Walker Evans. but what do they see and what are they doing under that cloth?! What they see is a secret but what they are doing is…framing, tilting, shifting, straightening, leveling, focusing and making sure nothing is distorted. What you see in the photo is the framing glass, film plane or back standard, many names for one part of the camera where all the action takes place. 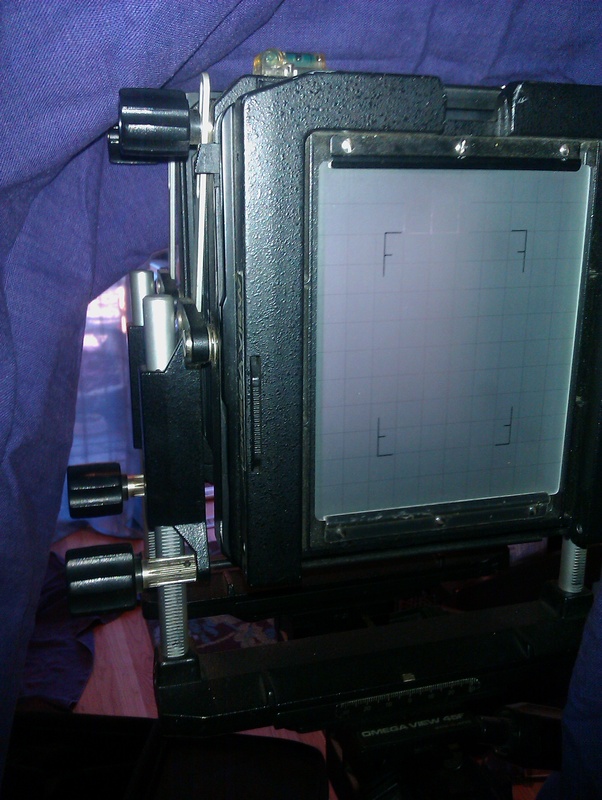 Most, but not all, large-format cameras are view cameras, with fronts and backs called “standards” that allow the photographer to better control rendering of perspective and increase apparentdepth of field. Architectural and close-up photographers in particular benefit greatly from this ability. These allow the front and back of the camera to be shifted up/down and left/right (useful for architectural images where the scene is higher than the camera, and product images where the scene is lower than the camera), and tilted out of parallel with each other left/right, up/down, or both; based on the Scheimpflug principle. The shift and tilt movements make it possible to solve otherwise impossible depth-of-field problems, and to change perspective rendering, and create special effects that would be impossible with a conventional fixed-plane fixed-lens camera. which leads me to the inspiration, the iconic and influence of my photography. thank you and thank you for visiting! You have some great historical shots here!